Shares in Rolls-Royce are crashing after the British engineering group warned of weaker profits for the fourth time this year. Rolls-Royce Holdings (RYCEF) fell by as much as 22% in London on Thursday, taking its losses for the year so far to nearly 40%. The company, which has no connection with the luxury automaker of the same name, said profits in 2016 would be hit by "sharply weaker demand." 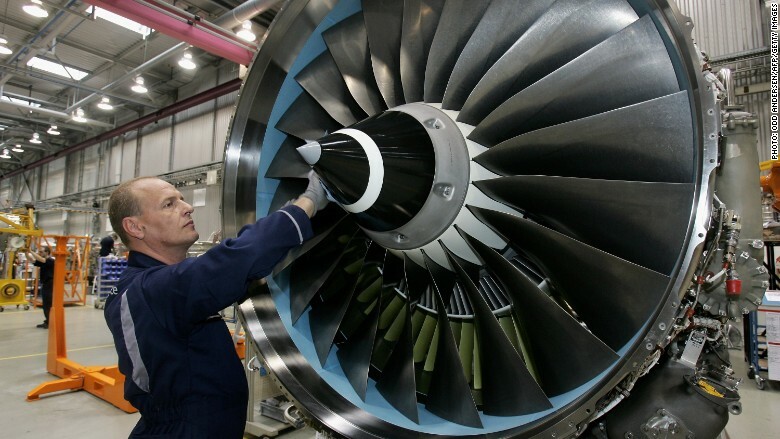 It blamed a drop in the number of corporate jets powered by Rolls-Royce engines in the third quarter for the grim outlook. The company also said demand for after sales services for corporate jets was falling. The performance of its marine technology business was also weaker. The market for large-cabin business jets has weakened this year. Corporate jet makers, such as Canada's Bombardier (BDRAF), have blamed slower demand from emerging markets. "The outlook for 2016 is very challenging," said CEO Warren East. "The speed and magnitude of change in some of our markets, which have historically performed well, has been significant and shows how sensitive parts of our business are to market conditions in the short-term." East became CEO in July, replacing John Rishton after the company missed a series earning targets. The fall in orders is partially down to low oil prices, which has forced many of Rolls-Royce's big customers to slash costs. Analysts expect more challenging times ahead. "Today's update confirms our fears around profitability," wrote Liberum aerospace analysts Ben Bourne and Jack O'Brien in a note. "East has traits that can drive success but investors will need yet more patience."